Technosoft has the expertise to design, develop and manage comprehensive HL7 interfaces conforming to the required standards, specifications and formats. We provide HL7 interface design, development, management, and support services. To exchange, integrate, share and retrieve electronic health information, Healthcare applications have a need for effective delivery of healthcare services. Health Level 7, HL7, is a health communications protocol for exchange of information between applications. It helps healthcare services providers to keep the information flow clean and secured by developing the integrated management systems. We have over 14 years of custom interface development experience and have worked on over 20 different custom billing interface implementations, among others. Our team of HL7 interface developers executed numerous successful projects in this field. Our HL7 interface planning process includes HL7 interface analysis (business requirements analysis, application analysis), HL7 interface requirements elicitation, HL7 interface specifications development, and HL7 interface testing. HL7 planning encompasses the first major activity for a unique health integration project. Application analysis – Direct client/vendors interaction to formulate exact interface requirements. A generic interface specification document development that you can use for future HL7 integrations. HL7 interface specification- An Implementation specific specification document to get sign off from the client after the requirement elicitation phase is completed. Database and object model design for interface data-flow to and from healthcare systems. HL7 interface testing – Test cases design, development, and execution. Deployment of the interface at the vendor’s development environment and testing. Deployment of the interface at the client’s test and production environment and complete testing. Provide maintenance and enhancement of existing interfaces. Can you increase level of patient-care if the data was easily accessable across different healthcare systems ?Can you save healthcare provider’s precious time if you had to enter data only in one system and that data flew into other systems automatically? 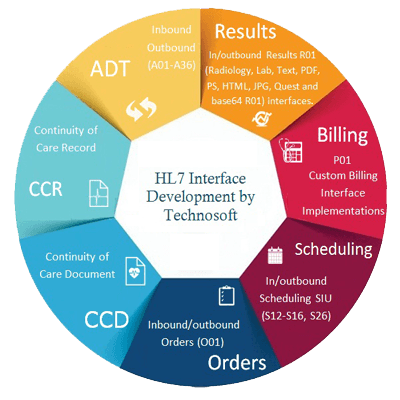 To assess the messaging and interfacing requirements in accordance with the HL7 messaging standards, Technosoft Healthcare IT specialists execute a detailed study of technology systems. We advise and guide clients on their integration strategy and the role of HL7 in establishing an integration platform in healthcare provider facilities. FHIR is a healthcare information exchange standard that makes use of an HL7-defined set of “resources” to support information sharing by a variety of means, including documents, messages, services, and RESTful interfaces. Clinical and administrative content (Observation, Patient, etc.) are defined in these FHIR’s Resources. The design of FHIR is based on RESTful web services, contrary to the majority of IHE profiles which are based on SOAP web services. With RESTful web services, the basic HTTP operations are incorporated including Create, Read, Update and Delete. We, Technosoft Solutions, have provided HL7 FHIR integration services to many hospitals and software providers. We have integrated with Epic and Cerner using FHIR Services. Other related services we have provided include FHIR Data consolidation tools development, etc. For details, please see our FHIR services. Support for SOAP & RESTful architectures allows for the seamless exchange of information using messages or CCD documents. All of the above services can be combined into one fixed cost per interface. This is the end-to-end development and deployment services where you do not need any integration, development and deployment specialist, we act as your integration department and take over almost all the work. Or you can choose to have us design and develop the interface and utilize your existing resources for the rest.